One of the greatest joys of the Crown is the opportunity to give awards to the deserving populace, but it is not always easy to determine who is deserving in any given reign. No two people can know everyone in a Kingdom, and this is why the Royalty needs the help of the people to advise them on the good work of their subjects. The best way to do this is via a letter of recommendation. Without your input, the Royalty will be unable to recognize those individuals who have given of themselves for the good of the Society. They look forward to hearing from you! Everyone! Ther e are often misconceptions that only Peers can write letters of recommendation, or that a person should not write a recommendation for an award that they do not have. Neither of these is true. While it may be true that those with higher level awards may have special insight into the criteria and requirements for an award, the knowledge and insight of even the newest member of the Society is welcomed by the Royalty. Anyone who feels strongly that they know someone who is worthy of recognition should write. And write often! If you live in a Barony, don’t forget to write to your Baron and/or Baroness for Baronial awards, too! The sooner the better! One of the biggest mistakes that people make is to write the Royalty the week before their local event and try to get awards for local folks. This is a disservice to everyone involved. The Royalty does not have proper time to determine if They wish to give the award. If They make a rush decision to give the award, the poor scribe has only days to get a scroll prepared. There may not be time to get a medallion or other items ready. If the Royalty decide to give the award at a later event, those people close to the recipient may not be present to see the award. If the Royalty decide not to give the award at all, then the person who recommended the potential recipient will be angry, and the potential recipient may not get the recognition they deserve. A good letter of recommendation for AOAs and Orders of Merit (the Sycamore, Keystone and Golden Alce, etc) will be delivered to the Royalty no later than eight weeks before the date of the event where the award is to be given. Six weeks is sometimes acceptable. Letters of recommendation for Peerages and orders of High Merit (the Fleur, Millrind, White Scarf, Gage, Scarlet Guard, White Horn, Golden Lance, and Scarlet Battery) should be delivered almost as soon as the Heirs are victorious in Crown Tourney. This is necessary because the Royalty need to consult these Orders before making a final decision to give an award. This may require several weeks as they wait for the Orders to meet and discuss the candidate that was recommended. To Whom Should We Write? When in doubt, write to everyone! 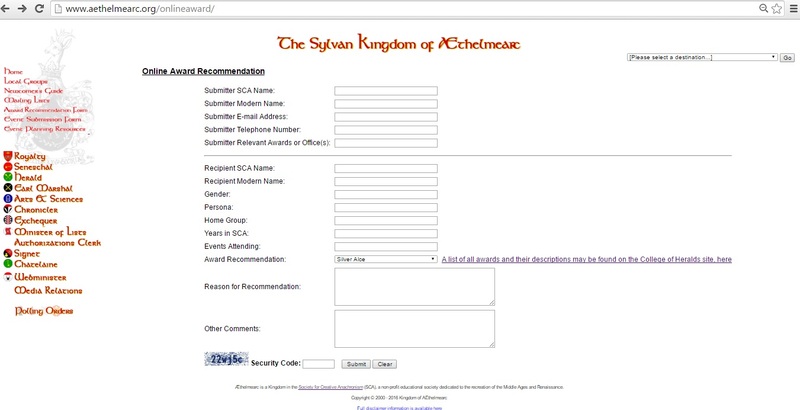 Our Kingdom has an Award Recommendation Form online that delivers to all the appropriate parties, so it should be nice and easy for you! If you prefer to send a direct email (or snail mail letter), here’s a good guideline: early in a reign, letters may be sent to King and Queen. 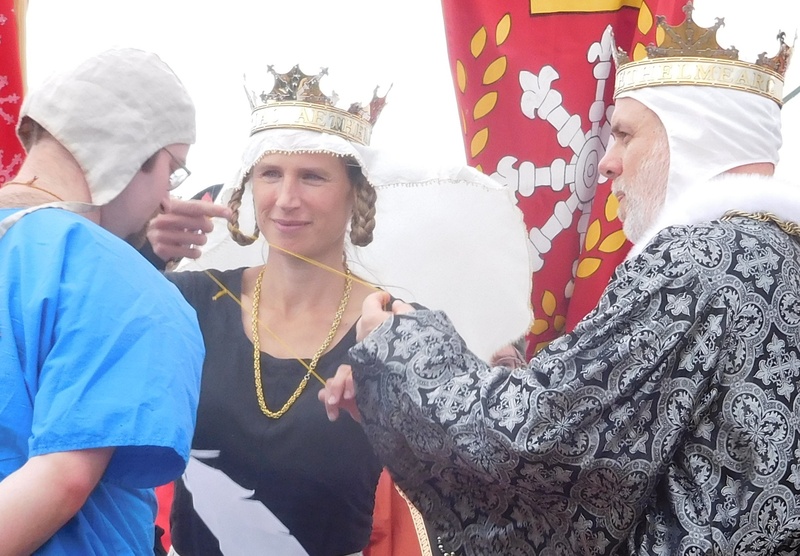 After Crown Tournament, the Heirs should also receive a copy of all letters (At some point in a reign, the King and Queen may request that all further letters be sent to Their Heirs). In addition to the Royalty, it does not hurt to send a copy of the recommendation for a Peerage or Order of High Merit to the Principal and the Clerk of the applicable Order. This way, the Order can get a head start on discussing the candidate. All the emails you need can be found on the Kingdom Website. If you’re writing folks in for a local Baronial award, just write to the Baron and/or Baroness. How exactly do I write a letter and what should it include? Recommendations should not be verbal! Use the Award Recommendation Form online, send an email (copying all the people mentioned above), or you can use good ol’ US Post Office Mail, if you like. Addresses are in the AEstel. All the email addresses you need can be found on the Kingdom Website. Other information about the potential recipient, such as their persona, how long they’ve been in the SCA, any Peer/associate relationships, etc. Your SCA and mundane names, your contact information, and any relevant awards and offices/positions you hold. How do I know what to write them in for? A list of our Kingdom’s Awards and Honors can be found on the College of Heralds’ website. A few years ago, there was a series of articles in the AEstel with more details. Things have changed a bit since then, with more awards now available (including a new Peerage! ), but copies of the articles are available here. If you’re still not sure, you can ask your local officers (like your local Baron and/or Baroness, Seneschal, Herald, etc), Peers, or anyone who’s been around a while. It’s also a good idea to check and see if they already have the award! The College of Heralds keeps a list of everyone who’s gotten awards, called the Order of Precedence. Just look the potential recipient up there. Go to the alphabetical list, and scroll or Ctrl+F will work fine. Why Was the Award Not Given? Sometimes, despite all your best efforts, a person will not receive the award you recommended. Why is that? There can be several reasons. Some Royalty requires that more than one letter is received. It can’t hurt to encourage your friends to join in a letter writing campaign to get someone an award. Individual letters are better than petitions, but a petition is better than no letter. Your letter may have arrived too late for Their reign or not at all. (It’s a good idea to keep copies of your sent emails, or a screen shot or copy of what you wrote on the online form). Your friend may just not be ready for the award yet. This is a tough one to accept, because we see all the work that our loved ones have done and we want them recognized. However, there are many criteria for receiving an award and they must all be met. What are some examples of letters, poor and good? I would like to recommend my brother Charles Norris for a fighting award. He is an excellent fighter and should be recognized. We don’t know whom this letter is from. What is her full name? How can we contact her with questions? Does she have any credentials? The letter should contain the potential recipients SCA and modern names. Which is this? The letter does not clearly state which award level is appropriate for the recipient. There are no details around why the person should receive an award. Is the fact that he is her brother the only reason for the letter? At this point, it is a bit late to write the King and Queen – Their decisions are almost certainly already made. To Byron and Ariella, King and Queen of AEthelmearc, Marcus and Margerite, Heir and Heiress, and Sir Koredono, Clerk of the Order of the Gage, does Lady Mary of London, Knight Marshal for your Shire of Endless Valleys send fond greetings. I would like to recommend my brother, Lord Charles the Bloodthirsty (m.k.a. Charles Norris) for induction into the Order of the Gage. Charles has been an active heavy weapons fighter for the last six years, and his skills have increased significantly during that time. He is currently squired to Sir Robin of the Hood. He recently made it the quarterfinals of your Crown Tourney, and he won two local tournaments – one here in Endless Valleys and one in your Barony of Ashland – this past month. I feel his fighting skill is on par with those who have been previously inducted into the Gage, and I ask that you consider him. Charles is also our local Minister of Arts and Sciences, and a fine brewer and embroiderer. He is active in our local group, and he never fails to work at a local event. Last, but definitely not least, he is courteous and kind, and he brings honor to everything he touches. Charles will almost certainly be attending all of the upcoming War Practices, the Turnip event in Endless Valleys and the annual Anvil Festival in the Canton of Worpshire. If you are in need of any additional info, please feel free to contact me at (176) 555-5555, email: mary@gmail.com, or by Facebook or G+, screen name Mary Norris Smyth.